The Shannara Chronicles continues its summer run on SPIKE. 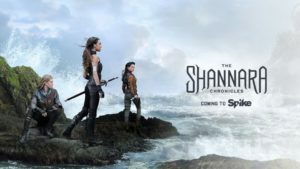 You can catch The Shannara Chronicles Season 1 on SPIKE TV Thursday nights at 2300 ET/PT. The Shannara Chronicles is based on the second book of the original Shannara series, The Elfstones of Shannara written by Terry Brooks. Wil and Amberle desperately search for Eretria to save her from the vicious elf hunters who kidnapped her. Little do they know, she’s stumbled upon a secret settlement of Humans and may finally feel like she belongs. The Shannara Chronicles stars Austin Butler (Wil), Ivana Baquero (Eretria), Manu Bennett (Allanon), Aaron Jakubenko (Ander) and Marcus Vanco (Bandon) along with new cast members Vanessa Morgan (Lyria), Malese Jow (Mareth), Gentry White (Garet), Caroline Chikezie (Queen Tamlin), and Desmond Chiam (General Riga).